SCRUTINIZER_BRANCH The branch that this inspection belongs to. For pull requests, this equals the target branch. SCRUTINIZER_PR_NUMBER The number of the pull request if the inspection refers to a pull request, otherwise not set. SCRUTINIZER_SHA1 The revision of the head commit. For pull requests, this equals the merge commit sha on GitHub, and the head sha of the source branch on Bitbucket. SCRUTINIZER_INSPECTION_UUID The UUID of the inspection. SCRUTINIZER_PROJECT Your project's qualified name, f.e. g/scrutinizer-ci/worker for GitHub hosted projects, or b/scrutinizer-ci/worker for projects hosted on Bitbucket. SCRUTINIZER_NODE_NAME The name of the node in which the build is currently running. Scrutinizer automatically makes sure that these variables are propagated to all relevant processes. For example, if you are using Apache2, we automatically add these variables to the virtual host configuration. We will automatically merge this configuration with the .scrutinizer.yml in your repository. 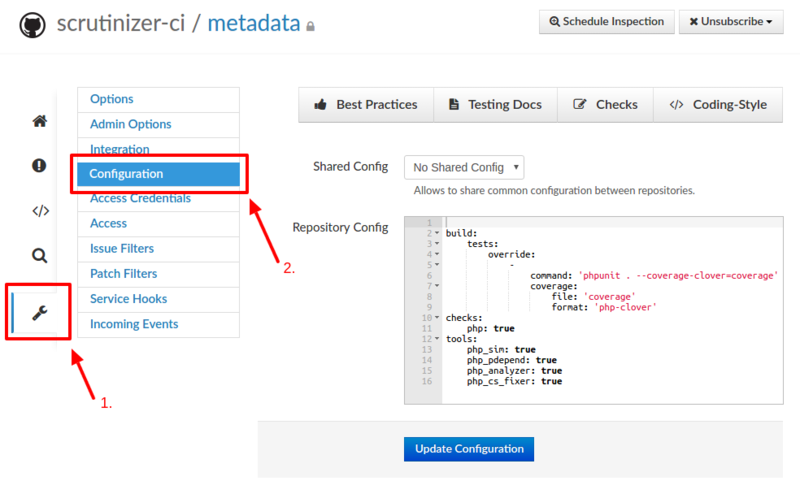 Read more about our configuration best practices to learn more about the pros and cons of where to keep your configuration. If you would like to share environment variables across projects, you can define a build in your global configuration. Then, it will automatically be inherited by all projects that use this configuration.